Besides “smooth, dry ride” and “tracks like it’s on rails,” “attention to detail” ranks as one of the most over-used clichés in the boat building business. Craftsmen, not laborers, build your Jarrett Bay. At the onset, an empty shop becomes a teeming workplace where these professionals ply their trades. As your boat goes from framing and sheathing to engine installation and systems rigging, and finally interior joiner work and final finish and fit-out, it’s literally crawling with specialists, each taking the utmost pride in their work. The scene is a busy one, and it can be hard for the uninitiated to see what’s really going on. But look close. See how that fourth generation carpenter removes a select board from your stateroom to his bench, dubbing it with a final swipe of his plane, achieving a fit so precise it looks as though it was grown in place once installed. Notice the electrician, wiring with such care that each terminal crimp is a replica of every other one, and each cable run so neat that tracing a short 80 miles offshore in a rolling sea will be easy to accomplish. Peer over the shoulder of one our lamination technicians as he wets out the fiberglass sheathing the Okoume hull planking. He’ll work the epoxy resin deftly, making the ‘glass fabric go completely transparent, eliminating the air bubbles that can cause structural and cosmetic problems down the road. Look into the faces of these men as they work. The expression is concentration mixed with the pleasure and pride, a demeanor unique to top professionals completing the jobs that they have mastered over countless years of pursuing perfection. Naturally, our attention to detail is as evident in our boats as it is in the workmanship of those who build them. Structurally, note how a ramped bead of epoxy, called a “fillet, ” runs along the perimeter of mating surfaces, such as where the stringers or a bulkhead meet the hull. Time consuming, yes; but this eliminates hard spots and better distributes the loads these structures endure. For joiner work, you might inspect a row of cabinets. These will be scribed in place, of course, so no gaps will be visible around them. But take a closer look, and you’ll see that not only are the doors and drawer fronts, but the frames themselves, are made from the same piece of book-matched wood. The exterior finish of a Jarrett Bay is also worthy of your scrutiny. We use our in-house paint booths and factory-trained pros to spray large surfaces with a highly durable, proprietary polyurethane coating blended by Alexseal. And, we take the extra time to mask off and spray even the tightest areas, such as rigging stations and cockpit lockers, to avoid the inevitable blemishes from overspray on the interior of these structures. 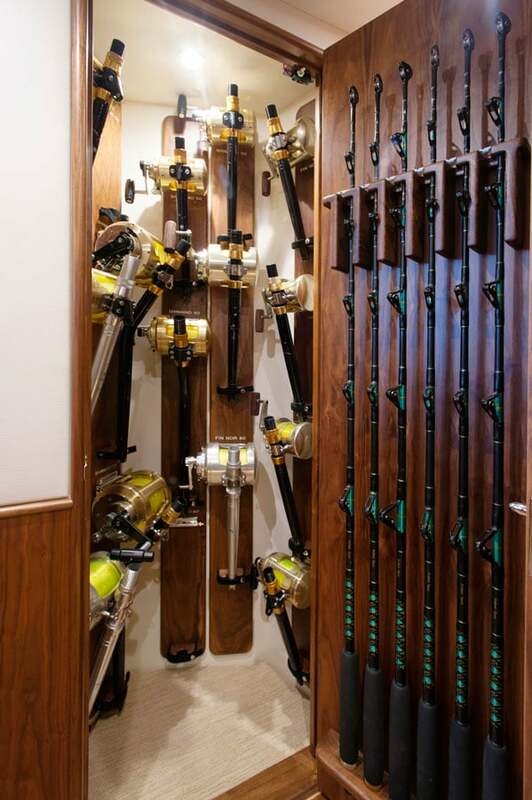 At Jarrett Bay, attention to detail starts with your desire for the world’s finest sport fishing yacht; it is then exacted by master craftsmen, and culminates in one of the most robust, easily serviceable and truly custom boats you’ll find on the water. Right down to the places most never see. 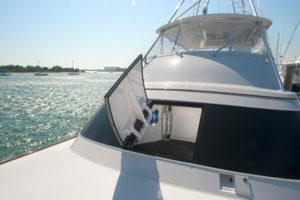 At Jarrett Bay our attention to detail is far more than just a catch phrase – we deliver truly custom dreams.